Iona Light is a spiritual partnership between Shabdan and Shastra. We met in the year 2000 on the island of Iona off the coast of Scotland. We were both looking for spiritual unfoldment. Shabdan was a Reiki Master, healer and musician who had already channelled and distributed Ascension Reiki. Shastra was still working full time in business and doing healing in her spare time. In 2002 we established Iona Light and began to run workshops and develop spiritual products to help people like us move forward. Much of our work is based on spiritual keys that unlock energies and facilitate spiritual growth. We started with a single product, a cushion printed with a powerful energy matrix that has since evolved into SoNa Radiance, and we now offer a whole range of CDs, spiritual tools and books. On this website you will find information about our programme and workshops, products (including Ascension Reiki) and a small section on angels that may introduce you to some angels you do not already know. Shabdan's website (see the link on the menu bar) features information about what he sees happening energetically in the world, as well as updates about his work, special events, free healing tools (experiencing is believing!) and healing tools by donation. We hope you will find something here to interest and inspire you. We have an email contact list to which we send occasional messages - you are very welcome to join. Shabdan is a musician, healer, workshop leader, Reiki and An-tu Master with extraordinary clairvoyant skills. The spiritual name 'Shabdan' means 'Bridge of Light', and Shabdan's role is to help healers, lightworkers and the Earth to move foward. He is a third-dimensional incarnation of Lord Anju, 'Keeper of the Keys of Creation'. In 1999 he channelled and developed Ascension Reiki, a new and refined healing energy for our era. He has crystallised various spiritual technologies including a unique range of matrix energy devices for self-healing. Together with Shastra, he helped to link An – tu energy to the Earth - this is a gold healing ray of pure loving energy for earth healing and light workers. Shabdan works with the ascended masters and the angels. He was asked by Archangel Metatron to bring the Keys of Metatron to Earth through music so that people could receive these essential light codes without interference from the mind. As an enlightened incarnate aspect of Lord Anju, Shabdan has access to unique spiritual keys which he shares through the healing tools he develops and through workshops and personal or telephone healing sessions. A musician at heart, he continues to explore ways to offer healing through music. 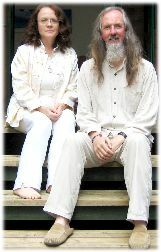 In recent years his role has shifted more towards preparing the Earth and her lightworkers for a major shift in consciousness, cooperating with the Masters of Shambhala through The Source Project to bring the 5th Dimension closer to Earth, and with Supra-consciousness to develop faster and more effective spiritual technology tools. You can visit his website shabdan.com to find out more. 'Keeper of the Gold Ray' reflecting an aspect of the energy to which she belongs. Shastra works with angelic and crystalline vibrations, giving occasional talks at health fairs to help people experience these wonderful energies direct, sometimes through sacred sound. Working with the Seraphim, she combines angelic love with sound and crystals in her range of Seraphim Crystal Sound Essences - fragranced aura sprays to raise your vibration and help you feel good. Each essence also carries deeper spiritual vibrations to support healing and spiritual growth. Shastra is a trained Power of Sound Teacher, An-tu Master and energy healer, but took time off in recent years to focus on self-healing. She crossed the Enlightenment threshhold in 2011. Her spiritual heritage is as an incarnate aspect of Lady Kirusana, a Keeper of the Sacred Rays and the Sacred Flames closely linked to crystal consciousness, but much of Shastra's current work on Earth is practical. She handles the mail order side of the business, coordinates workshop registrations and accounts and works together with Shabdan on transforming his keys and spiritual inspirations into physical products. She coordinates group self-catering on residential workshops and is (still) developing a book of recipes helpful to those seeking a diet that better harmonises with their spiritual growth.